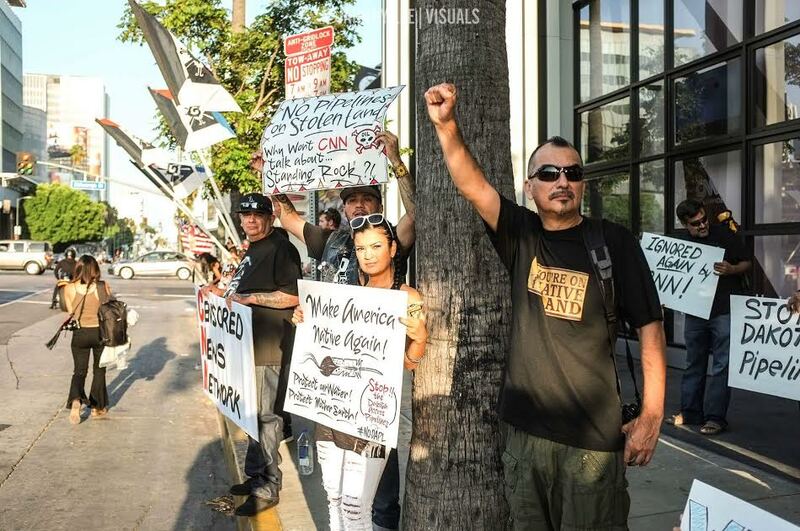 Los Angeles Indigenous community and allies gathered at the Mainstream Media Blackout protest outside the Hollywood CNN Building; hosted by AIM So Cal. Jahnny Lee Visuals (used with permission). 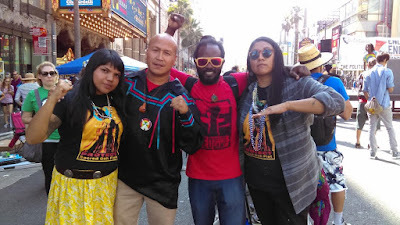 Native recording artists Crystle Lightning and MC RedCloud of "Lightning Cloud" at the Mainstream Media Blackout protest. Stephanie Mushrush, Cody Hall, Anthony Rogers-Wright and Carrie Curley gather after festivities at the “Enough is Enough” rally in Hollywood. 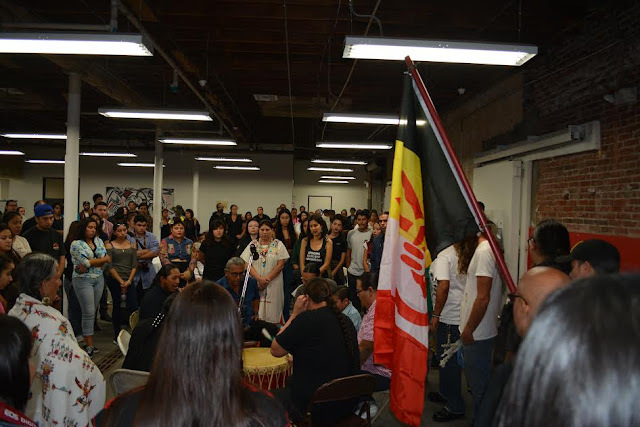 LOS ANGELES – SEPTEMBER 1, 2016 -- The fight to protect water, sacred sites, and treaty rights was brought to the ancestral Tongva and Kumeyaay lands of Los Angeles and San Diego, at four separate events this past weekend in the Southern California area. 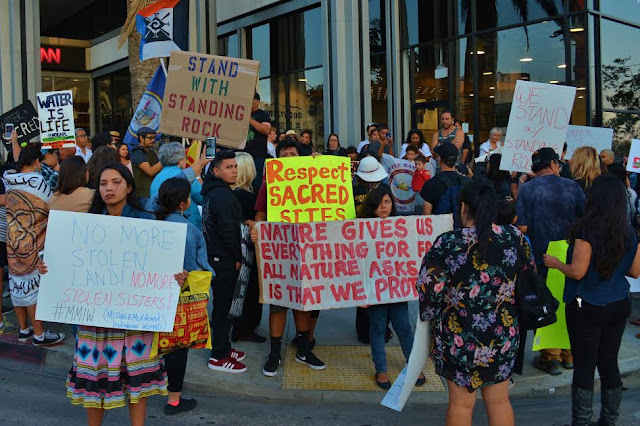 The events came about after members of the LA and San Diego Indigenous communities, American Indian Movement – Southern California, and allies, saw a need for support and solidarity for the Standing Rock Sioux Tribe in North Dakota. Standing Rock and allies have occupied Cannon Ball, North Dakota – reportedly growing from 30 to over 3,000 in just a few weeks – in order to fight the Dakota Access Pipeline. Known as the “DAPL,” the pipeline threatens the tribe’s and residents’ water supply, sacred sites, as well as treaty rights. The weekend kicked off on Friday evening with a community benefit at Self-Help Graphics and Art, featuring music, art, and speakers, raising over $2300 in funds for the Standing Rock’s Camp of the Sacred Stones. Hosted by the LA Indigenous community and AIM So Cal, powerful musical acts included the Spirit Lake Drum, Aztlan Underground, Maya Jupiter, Cempoalli, and others. 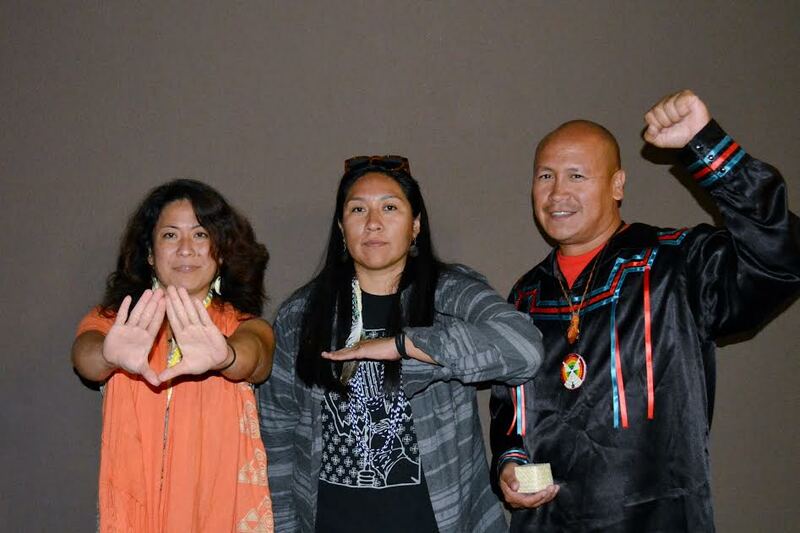 Guest speakers included Carrie Sage Curley (San Carlos Apache, Apache Stronghold), George Funmaker (Dakota, Ho-Chunk), Shannon Rivers (Akimel O’otham), and Kalama O Ka Aina (Hawaii, Mauna Kea protector). Attendees stood proudly as a group of powwow dancers danced to the American Indian Movement Song, sang by Spirit Lake Drum. A large banner reading “IDLE NO MORE” graced the stage, with a man eagerly holding it up for the full venue to see. The excitement level was high, with many surprised at the large crowd and level of support, and the diversity of tribal and allied representation present. Aside from the stage and information tables, Curley painted in the back venue area. Invited by the LA Indigenous community to present about her involvement with Apache Stronghold, Curley informed the crowd through her speech and art. She worked diligently on an image of a young Apache woman at her sunrise dance held at Oak Flat, on a canvas intended to represent the Save Oak Flat movement throughout the weekend. The event drew members of the LA Indigenous community, including Native couture fashion designer Bethany Yellowtail, as well as allies, including Asher Underwood of Indie.Genius.Media. “We came in solidarity to help get the message clear that we stand against the Dakota Access Pipeline. This event is very powerful and inspiring, with so many nations and peoples representing from across Los Angeles,” he said. 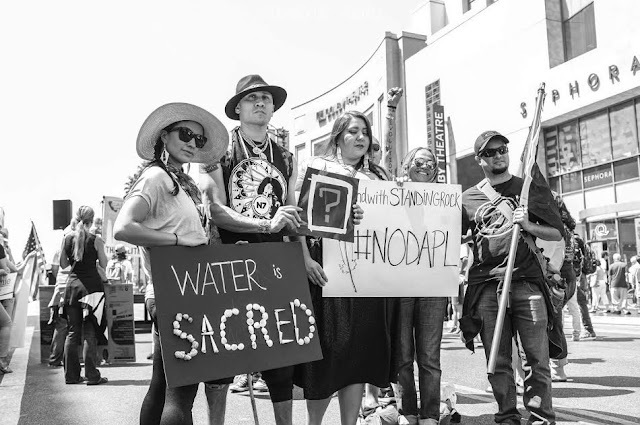 The #NoDAPL weekend agenda continued on Saturday morning, with a large rally and march that closed the infamous intersection of Hollywood and Highland. The “Enough is Enough” event was organized by California for Progress, featuring speakers and performers from various organizations; the event also served as a fundraiser and support for the Standing Rock’s fight against the DAPL. American actress Shailene Woodley joined the roster of speakers, along with Funmaker, Curley, and Cody Hall and Anthony Rogers-Wright, both of whom flew in from Standing Rock camps for the weekend’s events with messages about the fight against the DAPL. The crowd marched to the Hollywood CNN Building, across from which, AIM So Cal members held a large banner that read “#NoDAPL,” while – in front of a line of police officers and their cars, fancy shawl dancer, Cheyenne Phoenix danced on the street to Funmaker singing the AIM Song. The LA event ended with California bird songs, handshakes and gratitude for connection. “I’m so thankful for the people that work hard to bring the LA Native community together to fight for our rights, the land, and our water! This weekend was a beautiful thing to witness!” exclaimed Mashkawizii Ikwe, Anishinaabe. Another attendee, documentary filmmaker, Jahnny Lee, shared his calling to join the resistance in order to capture the historic fight; Lee has set up a Go Fund Me in order to raise funds for his filming in Cannon Ball, ND. The Los Angeles and San Diego Indigenous community groups of AIM and Idle No More, and other groups, report that they are planning to continue solidarity events for Standing Rock and other resistance movements around Indian Country, including issues such as freeing Leonard Peltier; in the days since the weekend, various cities have begun planning for simultaneous community gatherings for September 9, 2016. Kalama O Ka Aina, Carrie Sage Curley, and Cody Hall representing their nations’ fights to Protect Mauna Kea, Save Oak Flat, and #NoDAPL. Jahnny Lee Visuals (used with permission). Taboo of Black Eyes Peas, Bethany Yellowtail, and others show support for Standing Rock at the Hollywood “Enough is Enough” rally. I am not a native American but I do believe that the water suppy of this area and all over the world is threatened by our over development and overpopulation. My husband and I are appalled at the waste in this country. Please know that there is support and heart felt prayer headed your way.